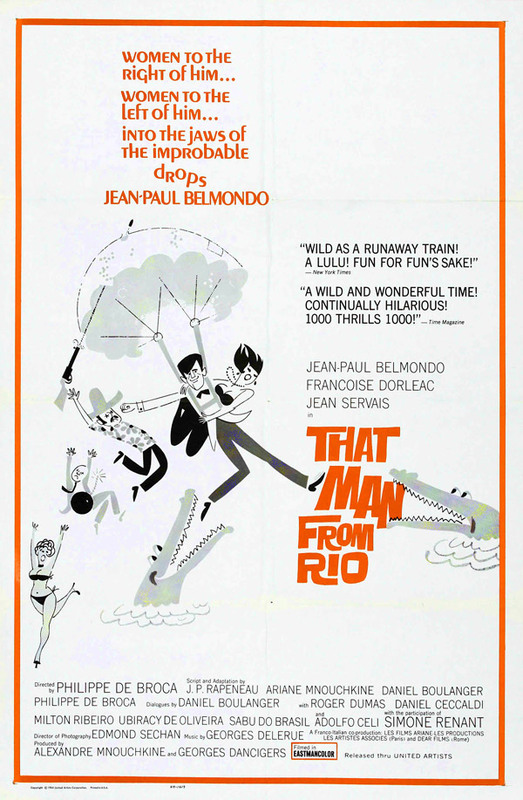 Off-beat French film mega-star Jean-Paul Belmondo stars in the zippy adventure spoof That Man from Rio, a humorous riff on spy thrillers, Hitchcock, and edge-of-your-seat Saturday afternoon serials. 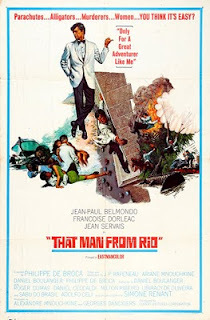 Belmondo is certainly talented — this film (as well as his monumental filmography) provides particular proof — but he has always baffled (and impressed!) me as a film star. No matter what the role Belmondo always seems miscast. Be it Breathless, Le Doulos, Is Paris Burning?, or whatever, Belmondo just doesn't seem to quite fit in. Yet maybe that's why he makes such a strong impression: he forces you to justify his presence in each of his films, and possibly this owes to his boy-next-door quality: Belmondo always appears to be in just a little over his head, and slightly baffled by what's happening around him. If Bogart always appeared to be one step ahead of everyone else in his films, Belmondo appears to be a step behind — to the benefit of himself and everyone watching. 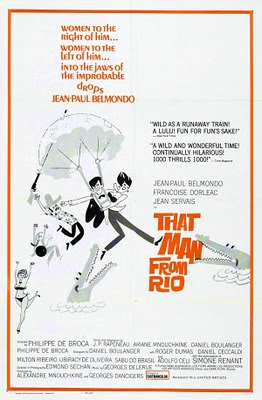 That Man from Rio finds Belmondo as Adrien Dufourquet, a member of the French air force set to enjoy a weekend pass in Paris with his girlfriend Agnes (Françoise Dorléac). Before Adrien can even get settled, Agnes is kidnapped and spirited to Orly airport, where she is drugged and loaded onto a flight for Brazil. Adrien pursues, and the first of the films many chase scenes unfolds. That Man never stops moving, as one pursuit sequence seems to fold into the next, as the movie sprints from Europe to South America and then back again. Planes, trains, automobiles, motorcyles, boats, and jungles vines — this one puts everything to use. The film owes a great deal to Alfred Hitchcock, and this is as much an homage as it is a spoof. Philippe de Broca deftly manages to evoke the same feeling — that particularly difficult to pull off melding of action and light comedy that somehow doesn't offend one's intelligence. Others have mentioned the James Bond connection, which given the production year of 1964 makes for a natural assumption, though That Man from Rio has a great deal more in common with North by Northwest than it does with Thunderball (despite sharing a cast member in Adolfo Celi). The film posters push the association as well. The one below is clearly designed to appeal to Bond fans, while the poster above more accurately represents the vibe of the movie — and dig that cool sixties style. Belmondo is clearly channelling his best Cary Grant, while Georges Delerue's music is positively Herrmann-esque. If Hitchcock and Bond have anything in common, it's the presence of a MacGuffin — and That Man from Rio has one too. In this case it's a set of three Amazonian statues that lead somehow to a hidden cache diamonds leftover by the fictional Maltec civilization. Everyone is after the statues, yet the identity of the film's bad guy is its most closely-kept secret. Instead, Adrien spend most of the running time either running to or away from the criminal mastermind's native goons — all of whom sport poison dart-firing pistols and seem to be made of something stronger than steel — in an effort to retrieve the pale-beauty Agnes. That Man from Rio is a fun ride, albeit a difficult one to find. It's a movie lovers' delight, referencing everything from silent Harold Lloyd to Hitchcock, and even anticipating the adventure films of the following generation. By the end, viewers are certain to feel as if they've left Hitchcock behind in favor of Indiana Jones. Lawrence Kasden and Steven Spielberg certainly saw this before Raiders of the Lost Ark — and just as Temple of Doom is best forgotten, I won't even mention Sir Winston, Belmondo's delightful little sidekick.